We were all rogues together.— Mary, Bernard Berenson's wife on the subject of art dealer Duveen and art historian Berenson. The Italian Villa I Tatti must have been a very interesting place in 1937, which is the setting for Simon Gray's intriguing drama The Old Masters. Outside the gates of the splendid Villa, Mussolini and the fascists were gaining control; inside the Villa a high-level rivalry among the art elite is unfolding. Living at I Tatti is Bernard Berenson, the highly respected and influential art scholar, his wife Mary who feels considerable guilt for having left her first husband and much-loved children for the charismatic Berenson; and Nicky, Berenson's secretary and mistress. As Berenson, David Bryan Jackson is suitably erudite and mischievous; Jewell Robinson makes his long-suffering wife Mary a character for whom one feels sympathy and Thomasin Savaiano's Nicky is plausible in the part of Berenson's devoted secretary and mistress. Into this ménage a trois enters Fowles (nicely played by Steven Carpenter), a scout for the devilish art dealer Sir Joseph Duveen. Fowles's success is minimal but the inhabitants of I Tatti are clearly warned about what is to come. Conrad Feininger (who, in real life, is the son and grandson of artists) has a very deep voice that carries much weight. Feininger is equally convincing as Duveen as he is in Duveen's impersonation of Samuel H. Kress. Duveen would like to sell the painting "The Adoration of the Shepherds," to Andrew Mellon, one of the newly rich American collectors, but a sale depends not on the price but on the attribution. Is the painting by Giorgione or by Titian? Will Mellon buy it? Or will the painting go to the nouveau riche, crass five-and-dime magnate, Samuel Kress. A debate ensues as the two friends/rivals duke it out. 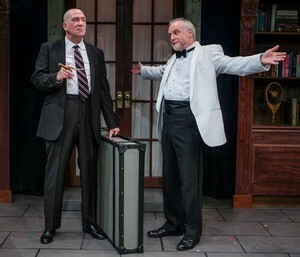 The play is quite "talky" but the issues it addresses —– the authenticity of attribution and the integrity of both the dealer and the scholar — are enlightening, entertaining, and good material for a serious play. As Mary says they were all rogues. Running time: 2 hours 10 minutes with one intermission. Washington Stage Guild, Undercroft Theatre, 900 Massachusetts Avenue, NW, Washington, DC; tickets $40 and $50; stageguild.org; 240-582-0500; January 2 to February 9, 2014.
Review by Susan Davidson based on January 17, 2014 performance.